Nothing feels as good as grilling food in the great outdoors. Whether you’re camping, fishing, or travelling in a RV, grilled delicacies can enhance your experience – and that’s why you need a folding BBQ grill. 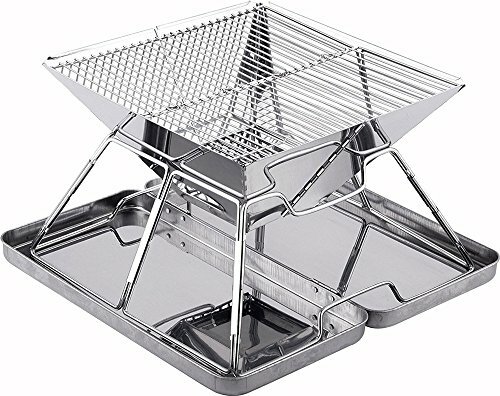 I love the UCO Flatpack Stainless Steel Grill because it’s the most compact grill on this list – it fits in a backpack! It comes in two sizes and has a raised stable base that keeps fire off the ground. Pack it in your backpack and get ready for an outdoor barbeque experience of a lifetime. Sate your appetite for fish burgers, hot dogs, steak, and grilled corn with the stainless steel Charcoal BBQ Grill by Fox Outfitters. Small and portable, it is great for picnics, backpacking, hiking, and small-space grilling. 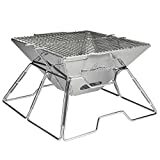 Uten has two folding grills on this list: the small and large Barbecue Charcoal Folding Grills. The small one is the cheapest here and gives meats a smoky grilled flavor. It is heat-resistant, scratch-resistant, and does not warp. 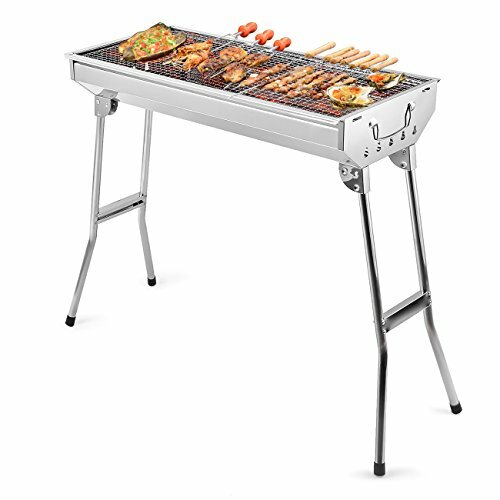 The large Uten Charcoal Folding BBQ Grill is ideal for small get-togethers and parties. It is made with rust-resistant stainless steel and has a 1-year warranty. Carry it when traveling and enjoy delicious food anytime and anywhere. If you want a stylish folding BBQ grill, it’s the SANNO Portable Barbeque Grill. It uses both wood and charcoal and is very easy to set up and fold. It has a non-stick grilling surface and a carbon steel firebox that’s resistant to heat. Grill size: 12" x 12"; Great for burgers, fish, steak, hot dogs, corn and more. Assembled size: 13" x 13" x 8.5"; Folded size: 13.5" x 7.25" x 2.25"
The Quick Grill folding grill set is a great way to take grilling with you wherever you go. Whether it's on a camp out, at the RV park or in the backyard, your Quick Grill is a fun and easy way to enjoy a meal with friends and family. 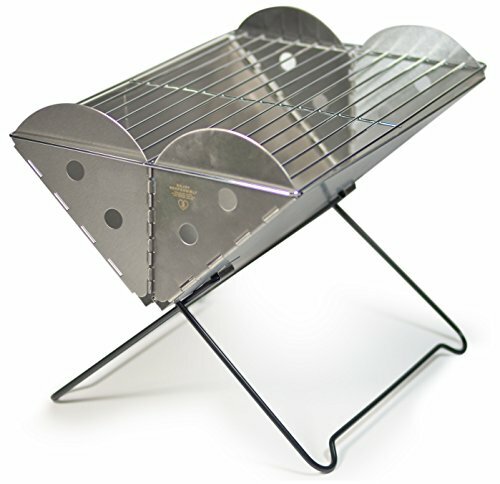 The highly compact design allows the Quick Grill to be easily set up and easily folded up for compact storage. Made with premium food grade stainless steel, your Quick Grill will last you years. Each Quick Grill comes with a convenient carry bag. 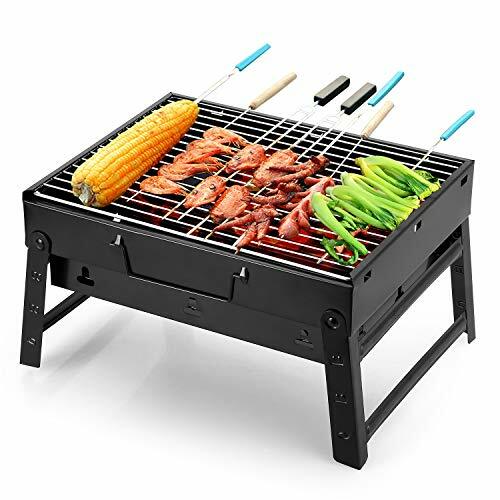 This large BBQ grill, super convenient for your taking to the beach, on a camping trip or anywhere you want. From that, Meat can get rid of excess fat and hence,even calories! Nutrients like proteins, vitamins and minerals present in your food remain intact and hence. 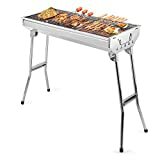 Grill net size: 12" x 12" 304 Stainless Steel Non-Stick grilling surface and Heat-Resistant carbon Steel firebox only requires 15-20 briquettes. Great for burgers, fish, steak, hot dogs, corn and more. Made from premium food grade 304 stainless steel. For use with charcoal and wood. Highly compact design, carrying bag is included for convenient storage and carrying. The best choice for family or friends to bbq.Unique design,great for tailgating, Perfect for camping, backpacking, picnics, tailgate parties, rv camping, trailers, parks, and grilling in small spaces safe. 1.This grill weighs 5.7 pounds and includes a carry bag for easy storage. 1.Suitable for 2 to 5people,this is the best choice for family or friends to bbq and fry food. 2.For use with charcoal and wood. 4. 30 second to install and clean. Don't need any tools when assemble or folding. 5. Stainless steel material, solid and excellent abrasive resistance, no rust, no twist, durable and long lasting. High quality & AMZON fast delivery & kindest service. GO ANYWHERE: ★ This tiny portable charcoal grill can go with you and your family for a road trip or a beach party etc. Perfect for 3-5 people family/party. COMPACT and STURDY: ★ Made of cold-rolled iron and premium chrome Wire mesh. Heat-resistant and scratch-resistant. Legs are more sturdy than similar products. FOLDABLE EASY STORAGE: ★ It can be folded away after you use. Handle designed make it save space and is convenient to take it to anywhere to have fun. 12 AIRWAY VENT: ★ Star a fire Faster and Easier with 12 Airway Vent design. Easy to clean as the baking net can be pulled out. WARNING: Use it on a flat, sturdy surface or table. SATISFACTION GUARANTEE: ★ We commits ourselves to creating high quality and great design products. Our product has 1 year warranty. Contact us for any issue we will do the best for you!